This is a book that was birthed out after having series of heartbreak on seeing many people take religious laws and activities to heart. Instead of us to focus on the development of our dear world, we forget ourselves in most of the doctrines of religion made by man and begin to tread wrongly. It's just so sad. 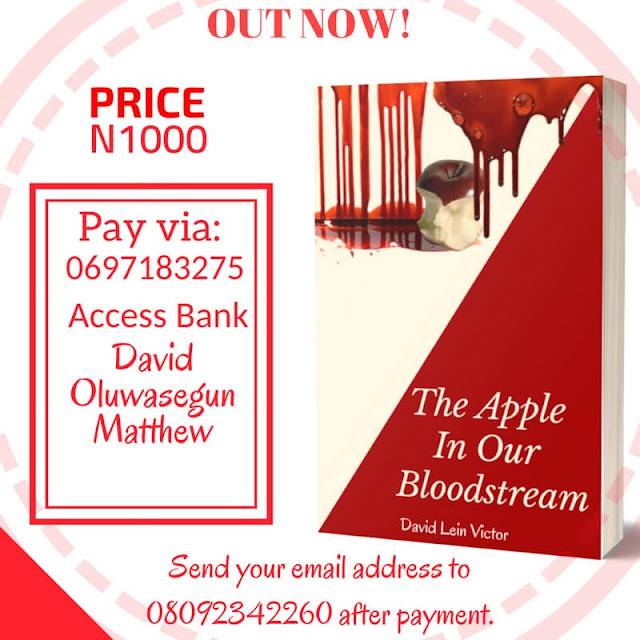 "The Apple In Our Bloodstream" shades more light on the mysterious secrets you can hold at your palm if you have a loving and altruistic heart, it helps you understand the mysteries behind God, the devil and humanity. Most pastors won't tell us these things. Still craving to know more about the book? Get a copy! Then send your email address, WhatsApp number to 08092342260 and your copy will be forwarded to you within 24hrs.